If you are examined by a chiropractor, you may be told that you have one or more subluxations of your spine. This article examines what this means and how you should react. Chiropractic theory is rooted in the notions of Daniel David Palmer, a grocer and "magnetic healer" who postulated that the basic cause of disease was interference with the body's nerve supply. Approximately a hundred years ago, he concluded that "A subluxated vertebrae . . . is the cause of 95 percent of all diseases. . . . The other five percent is caused by displaced joints other than those of the vertebral column." He proclaimed that subluxations interfered with the body's expression of "Innate Intelligence"—the "Soul, Spirit, or Spark of Life" that controlled the healing process. He proposed to remedy the gamut of disease by manipulating or "adjusting" the problem areas. Over the years, chiropractors have gone beyond Palmer's theories, although some still cling to them for dear life. Some describe subluxations as "bones out of place" and/or "pinched nerves"; some think in terms of "fixations" and/or loss of joint mobility; some occupy a middle ground that includes any or all of these concepts; and a small percentage renounce Palmer's notions as biotheistic nonsense—which they were. My mother often "diagnosed" a subluxated state in her brood of nine children by behavior—when one of us wasn't "himself," she suspected an adjustment was needed. More often than not, she was right. There didn't have to be a limp, antalgic lean, headache or expressions of pain. Sometimes, she or my father merely decided it was "time to get checked." If our practice members are encouraged to recognize very subtle signs of subluxation in themselves, like a change in sleep quality or general irritability, they will not only come in to get checked more frequently, they will often avoid the recurrence of that all-too-familiar back pain. . . .
. . . . The success and survival of a practice are greatly enhanced if subluxation identification, analysis and correction is the basis for the practice. When all members of the practice understand the premise that subluxations can occur and recur without associated symptoms, they will get their spines checked at least as regularly as they get their teeth checked—and usually more often than that. In a mostly symptom-oriented practice, patients are released from care, or release themselves from care, when their symptoms are gone. A constant influx of new patients is needed to replace them if the practice is to grow and ultimately survive . Chiropractors do not make the claim to be able to read a specific subluxation from an x-ray film. [They] can read spinal distortion, which indicates the possible presence of a subluxation and can confirm the actual presence of a subluxation by other physical findings . In 1973, Congress authorized payment under Medicare for chiropractic treatment of "subluxations demonstrated by x-rays to exist." In 1972, to enable payment, chiropractors held a consensus conference that redefined "subluxations" to include common findings that others could see. The document, several pages long, described the supposed x-ray manifestations of 18 types of "subluxations," including "flexion malposition," "extension malposition," "lateral flexion malposition," "rotational malposition," "hypomobility" (also called "fixation subluxation"), "hypermobility," "aberrant motion," "altered interosseous spacing," "foraminal occlusion," scoliosis, and several conditions in which "gross displacements" are evident . I have been unable to determine how many billions of dollars chiropractors have received from Medicare since the law took effect. Some of these terms are fancy names for the minor degenerative changes that occur as people age. The conditions often have nothing to do with a patient's symptoms and are not changed by chiropractic treatment. Some, as acknowledged by the conferees, are not even visible on x-ray films. In 1997, Congress amended the law to permit payment for subluxations diagnosed by other means—a policy scheduled to take effect on January 1, 2000. Chiropractors also differ about how to find "subluxations" and where they are located. In addition to seeing them on x-ray films, chiropractors say they can find them by: (a) feeling the spine with their hand, (b) measuring skin temperature near the spine with an instrument, (c) concluding that one of the patient's legs is "functionally" longer than the other, (d) studying the shadows produced by a device that projects a beam of light onto the patient's back, (e) weighing the patient on special scales, and/or (f) detecting "nerve irritation" with a device. Undercover investigations in which many chiropractors have examined the same patient have found that the diagnoses and proposed treatments differed greatly from one practitioner to another. Subluxation is also a medical term. The medical definition is incomplete or partial dislocation—a condition, visible on x-ray films, in which the bony surfaces of a joint no longer face each other exactly but remain partially aligned. No such condition can be corrected by chiropractic treatment. A subluxation is a complex of functional and/or structural and or pathological articular changes that compromise neural integrity and may influence organ system and general health . What the above means is that a subluxation is a joint problem (whether a problem with the way the joint is functioning, a physical problem with the joint, or a combination of any of these) that affects the function of nerves and therefore affect the body's organs and general health. This "definition" is still poppycock because the vast majority of spinal problems do not affect the body's organs or general health. (In addition, it makes no sense to use the consensus process to try to define something that is not a valid concept . If you'd like to have some fun, ask a chiropractor to list the diseases or general health problems that spinal manipulation can cure. In the late 1980s, the Vertebral Subluxation Research Institute (VSRI) was launched by Terry Rondberg, D.C., of Chandler, Arizona. Rondberg is president of the World Chiropractic Alliance (WCA), a group that promotes subluxation-based practice and is president of Chiropractic Benefit Services, a malpractice company that insures subluxation-based chiropractors. He also publishes The Chiropractic Journal (a newspaper for chiropractors), the Journal of Vertebral Subluxation Research and WCA News/ Health Watch (a weekly electronic newsletter that attacks what it considers to be "the dangers and abuses of medical and drug interests."). VSRI taught chiropractors how to recruit "research volunteers" and convert them into lifetime chiropractic patients. Its chiropractor clients were instructed to use telemarketing and other approaches to ask people to volunteer for a nationwide study on spinal conditions. During the first office visit they would be examined and given a brochure—"The Silent Killer"—which explains how subluxations can be caused by physical, chemical, and emotional trauma. (The brochure claimed, for example, that food additives, air pollutants, spoiled food, fear, worry, hate, greed, sadness, grief, emotional shock, and severe disappointment can cause muscle spasms that result in subluxations.) During the second visit, they would be advised to have their subluxations treated. TheVSRI program was concluded in 1991 . A subsequent WCA survey found that 65% of members who responded said that their patient education material referred to the vertebral subluxation as the "silent killer." The above ad from a telephone directory purports to show how misaligned spinal bones cause subluxations. A distributor of the poster to the right calls it "the most powerful single visual aid available." 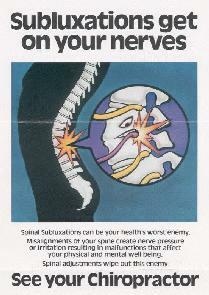 The poster to the far right, distributed during the mid-1980s, states that "chiropractic subluxations can be your health's worst enemy" and that "spinal adjustments wipe out this enemy." When—through physical, mental, or chemical stress—one of the 24 vertebrae in the spinal column becomes slightly misaligned, it's called a subluxation. When a subluxation occurrs, it puts pressure on delicate nerves, and the organ or body part at the other end of the nerve does not receive the proper messages it's so dependent on. This has been compared to someone stepping on a water hose, interfering with the flow of water. The vertebral subluxation does precisely the same thing, interfering with the messages from the brain to the body. When the communication from the brain to the organ is broken down, there is a malfunction and disease may eventually develop . However, the most important aspect of a subluxation is its affect on your nervous system. Compromising the way your nervous system controls and regulates your body can have grave consequences. Distorted communications between your brain and your body can cause all kinds of health problems beyond just headaches and backaches. . . . There are three basic causes of subluxations. Physical causes include slips and falls, accidents, repetitive motions and improper lifting. Stress, anger and fear are examples of emotional causes of subluxations. Alcohol, drugs, pollution and poor diet can be chemical causes of subluxations. . . .
You can have subluxations and not even know it. Like tooth decay or cancer, subluxations can be present before any warning signs appear. The results of a thorough examination can show the location and severity of any subluxations you may have . A vertebral subluxation is a spinal abnormality that interferes with your nerves. It can create dis-ease, lowered resistance to disease, pain, imbalance, fatigue and can pave the way for ill health. It is sometimes called the "silent killer" because it can slowly eat away at your health and vitality without your having the slightest awareness of it. . . .
Subluxations are so very common they can be considered an epidemic—nearly everyone has them. Subluxations can undermine your health just as termites can undermine the foundation of your home. . . . By the time symptoms appear a certain amount of the damage caused by longstanding subluxations may be irreversible. For that reason periodic spinal examinations to locate and correct vertebral subluxations should be part of every family's health routine. Correcting silent subluxations today could save you and your family from diseases that, later in life, could not possibly be ignored . Company president Tedd Koren, D.C., is a 1977 graduate of Sherman College of Chiropractic, the "straightest" of the chiropractic colleges. The company publishes a large line of subluxation-based patient-education brochures which suggest that spinal manipulative care can help nearly the entire gamut of health problems. A 1998 flyer for Koren's 12-hour seminar on "The Natural Superiority of Chiropractic" stated that a total of 24 million of these brochures had been distributed worldwide. The FTC claims that chiropractors can only tell patients that chiropractic care can be beneficial for low back pain. Nothing else, not subluxations, wellness, headaches, sciatica, allergies, children's health, ear infections, whiplash, etc. Although Koren Publications' literature states that chiropractic is not the treatment of diseases but the correction of vertebral subluxations, the FTC doesn't like the "impression" we're giving the public and patients . In or about mid-1998, the FTC concluded that Dr. Koren's activities constitute false advertising and or deceptive trade practices. The FTC sent him a proposed consent order and a proposed administrative complaint. The FTC said sign the consent order or face a lengthy and costly administrative proceeding. The proposed consent agreement basically prohibits Dr. Koren from making any public claims about the benefits of chiropractic unless the claims are supported by scientific studies which the FTC believes to be authoritative or valid. . . Although Dr. Koren's specific message is somewhat different from Dr. Rondberg's, their activities are quite similar. Both sell books and pamphlets which sometimes are distributed by chiropractors, and both are strong advocates of the benefits of chiropractic care. . . .
Dr. Rondberg does not believe that chiropractic is a direct cure or even a treatment for any disease or condition other than vertebral subluxation. However, all chiropractors believe that keeping the spine healthy and correcting spinal nerve interference can have a beneficial effect, and may sometimes lead to a resolution of some medical conditions. But Dr. Rondberg stresses that the purpose of chiropractic is to correct spinal nerve interference, not to treat any disease or medical conditio1 . On November 16, 1999, a federal judge granted the FTC's motion to dismiss their suit. In 2001, the FTC abandoned its effort to limit Koren's claims. The FTC itself made no public statement, but articles in chiropractic publications describe a six-year investigation that ended in June 2001 . I agree with Dr. Triano. I also believe that a consent agreement as broad as the one described above would have had greater significance than any other health-related settlement in the FTC's history. I suspect that the FTC dropped the case because it concluded that the brochures were "patient-education" materials rather than advertising and thus were immune to federal regulation. Koren notified me that my "conjecture" is incorrect , but he refused three requests from me to state what he believes is correct. We must finally come to the painful realization that the chiropractic concept of spinal subluxation as the cause of"dis-ease" within the human body is an untested hypothesis. It is an albatross around our collective necks that impedes progress. There can be no unity between the majority of non-surgical spine specialist chiropractic physicians and the minority of chiropractors who espouse metaphysical, pseudoreligious views of spinal subluxations as "silent killers." The latter minority group needs to be marginalized from the mainstream majority group, and no longer should unrealistic efforts be made toward unification of these disparate factions within the profession . The teaching of vertebral subluxation complex as a vitalistic construct that claims that it is the cause of disease is unsupported by evidence. Its inclusion in a modern chiropractic curriculum in anything other than an historical context is therefore inappropriate and unnecessary. . . . Practice styles promoting preset 'high volume' chiropractic care models as wellness care, which may contribute to inappropriate patient dependence, compromise patient confidentiality or require repeated exposure to ionising radiation are not part of an undergraduate chiropractic curriculum. Students should be taught to recognise that such approaches are not acceptable in terms of the best interests of patients or the chiropractic profession . The statement was signed by representatives of seven chiropractic schools, all located outside of the United States. Unscientific terms and concepts should have no place in modern health care education, except perhaps in discussions with historical context. Unless these outdated concepts are rejected, the chiropractic profession and individual chiropractors will likely continue to face difficulties integrating with established health care systems and attaining cultural authority as experts in conservative neuromusculoskeletal health care. .
My advice about "subluxations" is very simple. If a chiropractor purports to locate and fix them—"killer" or otherwise—seek treatment somewhere else. Palmer DD. The Science, Art and Philosophy of Chiropractic. Portland, Oregon: Portland Printing House Company, 1910. Strang V. Why continue chiropractic care after symptoms are gone: Survival of your practiuce may depend on it. Streams from the Fountainhead 3(1):9-10, 2001. Weiss R. Bones of contention. Health 7(4):44-53, 1993. Frogley R. Letter to Stephen Barrett, M.D., 1971. Schafer RC (editor). Basic Chiropractic Procedural Manual, fourth edition. Arlington, Va.: American Chiropractic Association, 1984. Chiropractic paradigm. Association of Chiropractic Colleges, 1996. Nelson C. The subluxation question. Journal of Chiropractic Humanities 7:46-55, 1997. Bodney DJ. Letter to Stephen Barrett, M.D. May 20, 1998. Rondberg C. The CA Advisor Training Manual: Basic Training for Chiropractic Assistants. Chandler, AZ: World Chiropractic Alliance, 1992. Esteb W. What patients want to know about subluxations. Denver CO: Patient Media Inc., 1999. Koren T. What Is a Subluxation?, Philadelphia: Koren Publications, 1995. Chiropractic Wellness: The Practice Building Journal from Koren Publications. Volume 1, 1998-1999, back cover. Distributed October 1998. Rondberg vs. Federal Trade Commission, filed Oct 28, 1998. Feds drop Dr. Koren's case: First amendment rights of health care professionals were at stake. Dynamic Chiropractic, Aug 2001. FTC questions Koren's claims. Is Koren Publications Just the Beginning? Dynamic Chiropractic, Sept 21, 1998, pp 1,17,42,49. Koren T. E-mail message to Dr Stephen Barrett, September 13, 2001. Murphy DR and others. How can chiropractic become a respected mainstream profession? The example of podiatry. Chiropractic & Osteopathy 16:10, 2008. Clinical and professional chiropractic education: A position statement. Société Scientifique dédiée à la Chiropraxie, May 15, 2015. The degree to which some chiropractic students are brainwashed with subluxation philosophy is demonstrated by email messages I get from time to time. The first message below came in February 1998 from a student at Parker Chiropractic College. The second came in March 1998 from a student at Life University. The third came in May 1998 from a recent graduate from Cleveland College. The fourth came in August 1998 from a Parker College intern who didn't specify which article(s) on Quackwatch had bothered him. 1. In order to bash something, you have to know what it is first. ALL chiropractors know that we can't heal anything, it is the body that does the healing. All we do is help the body maintain its normal function. In order to function normally, the nervous sytem must be able to flow freely, because it is the nervous system that basically controls everything else in the body. Whether it directly controls something such as muscles, or indirectly like enzyme release, it does effect every part of the body. In the course of the entire body, it is possible for the nerve to be compressed, either by bone directly, or by surrounding soft tissue. This works just like stepping on a water hose. If you step on a hose, the water coming out the end slows, and if you step hard enough, it stops. The same is basically true of nerves. If the nerve is compressed, then the nerve impulse is inhibited, if not completely stopped, thus affecting the area innervated by that nerve. Hopefully you will agree that if a specific muscle or other tissue loses its innervation, it will begin to atrophy, and can possibly die completely. All chiropractors do is move the surrounding bone and or soft tissue to relieve the compression on the nerve, thus allowing it to flow freely. The body can heal itself better than any drug can, and I think you know that. 2. As you well know, the body is an amazing example of communication and efficiency in that millions of cells are working together to achieve optimum function. Is the heart beating too fast? How much glucose is needed for the secretion of insulin? How much sodium in the blood stimulates the osmoreceptors in the HYPOTHALMUS to activate ADH? The answer is that communication between the BRAIN and the organs, glands, and cells of the body through the SPINAL CORD is needed for these functions to exist. How else would a structure in the brain (the hypothalmus) know that these processes are going on? Do subluxations cause an interference with this communication, that is the million dollar question. It is a theory, our theory, and it makes sense. I object to you calling us quacks and endorsing a closed minded approach to healing. In general, western medicine's philosophy of health in a pill is over-prescribed and harmful. . . . Millions are seeking alternatives, there is an innate healing power of the body, and chiropractors are well trained, intelligent health care providers. Much of the physiology of the body is still unknown, open your mind to new possibilities or you will be left behind. 4. If you believe that I am a "quack" for studying the amazingly wonderful entity of the anatomical human body and for learning the tremendous power that it possesses to both monitor and even heal itself (optimized by the removal of interference and toxins), then I must admit that I would never expect a doctor of your accomplishments and status to repeatedly express such a feeble, closed mind. My only goal as I enter practice will be to help everyone that I treat to obtain the maximum quantity and quality of life possible—the way the good Lord intended —without blindly accepting unnecessary poisonous drugs and surgery at the drop of a hat. Those things should be the final alternative, not the first and/or only choice. The Power that made the body heals the body. The problems should be addressed primarily, rather than the symptoms. This article was revised on Auguist 26, 2018.